Modern and classic, these elegant twisted design aluminum candle sticks are stylish as well as efficient and cost effective. A simplistic design perfected and enhanced, they gleam and shine in the candlelight on Shabbat evening. 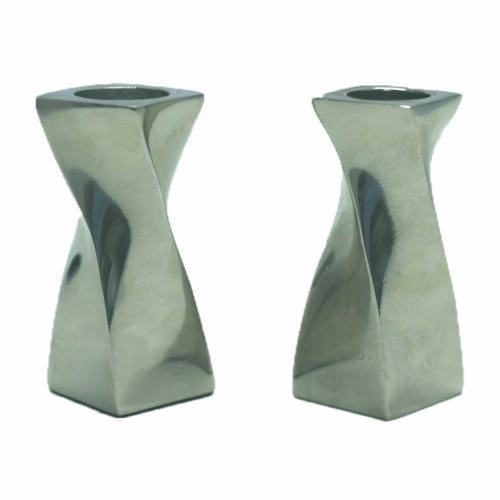 6cm tall, these small candlesticks are perfect for inviting in Shabbat at the end of the week. Made of aluminum, they feature a twisted design and are classy and elegant, while also being highly convenient and easy to clean and maintain. A delightful gift for a wedding, bat mitzvah, anniversary or otherwise, they shine and gleam in the light of the shabbat candles.